The internet is over 26 years old and although digital marketing has evolved over time, the foundation to success remains the same. Your website is often the first opportunity for your business to connect and engage with potential customers. You may struggle with identifying the ingredients that make up an ideal website. To help you along, let’s look at the basic principles of search engine optimization (SEO). 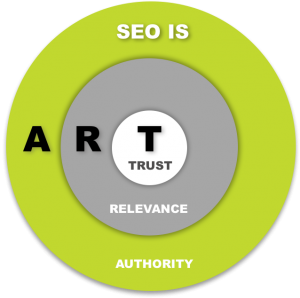 SEO is the process of establishing a website’s Authority, Relevance and Trust (ART) with its users. Google reminds us that a user can be defined as either a person or a search engine, “which helps other users discover your content”. Whether that search engine be powered by Google or Bing, remember that the primary goal is the same. These companies seek to connect their users with the best websites that provide the information requested. Linking to relevant, trustworthy sites, or ‘premium publishers’, that have the power to boost your site’s credibility and provide brand lift. These sites can position your content in front of an established audience, increasing interaction with could-be customers in a positive way. Content agency Digiday defines a ‘premium publisher’ as one where the audience actively seeks out the content. “This is not purchased traffic or link bait; this is a deep and ongoing connection”. Established media outlets are a great example of a ‘premium publisher’. Sharing and re-purposing your content on popular social media platforms. Think Mobile – According to a report by ComScore, approximately 70% of digital media time is spent on mobile devices. As a response to this trend, Google takes your website’s mobile compatibility into consideration when ranking. Also consider that consumers are attracted to ease and convenience. If they must waste time adjusting the page to fit their screen, having to pinch and zoom to read the content, they are likely to get frustrated and leave your site. 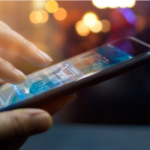 There are a few different ways to set up a mobile-friendly site, however the recommended practice is to use a responsive web design, meaning that the site’s layout adjusts to fit the screen of your device. Rather than building a separate mobile site, responsive web design uses the same code and URL. If you are not sure if your site is responsive, make sure to reach out to your webmaster for assistance. Security – If you collect information from consumers on your site, make sure that it is secured with an HTTPS connection. This bolsters confidence in your consumers, confirming that they can provide you with sensitive data such as names, addresses, phone numbers and payment details without fear that it will be compromised. Even if you are not an e-commerce store, utilizing HTTPS is recommended as Google takes this into account as part of their ranking process. Opportunity to convert – While this is not a factor that impacts SEO, it will impact your ability to drive more leads. Is your contact information easily accessible on your site, or will a prospect need to click through several pages to find it? Best places to include links to your contact information include the homepage and footer of your site. In fact, some brands have noticed at least a 50% increase in conversion rate when including specific calls-to-action, such as “Email Us” or “Call Now” in the footer of the site. Are your web forms responsive for mobile devices? Do you have mapping set up so that prospects can easily input their starting location and get directions to your store front? Make getting in touch with you as easy as possible. There are many additional factors that influence rankings on search engines and success of your website. If you start with these items, you will be well on your way to building a strong foundation for your marketing efforts. Remember that SEO success does not happen overnight. Cooke suggests that, “Like a 401k, consistent input and patience are the best approach…” You may consider teaming with a qualified SEO partner who remains knowledgeable of latest trends and has the resources to consistently optimize your site to enhance visibility. NJ Advance Media has a team of dedicated SEO strategists who are eager to walk through your site and make recommendations that will lead to tangible results. If you are interested in learning more, contact us today.